The Radio Holder is made with 2" wide ballistic nylon webbing. Our radio holder is designed to hold most current brands of two-way radios used in the fire rescue industry such as the Motorola XTS 2500, Motorola APX 6000, and many more. 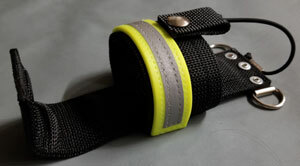 It is made with 2" wide ballistic nylon webbing with a steel insert between the two webbing layers. Hot yellow webbing and 3M Scotchlite silver reflective trim are stitched across the front wrap of the radio holder for extra visibility! The holder has an adjustable closure that secures the radio in place. It also has a strap that secures the radio from the top to keep it from shifting upward during vigorous motion. Metal rings are secured to the holder for attachment to any radio strap and is a lightweight, streamlined design. The hardware on this radio holder is the same hardware you will find on our leather radio holder. Very lightweight yet exceptionally durable!